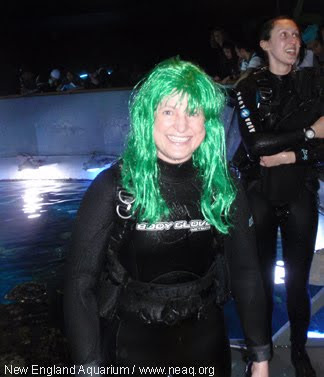 While revelers were teeming through the streets of Boston in search of all things Irish on St. Patrick's Day, Sarah brought a little more green to the GOT -- as if green moray eels and Myrtle the 550-pound green sea turtle weren't enough green for one tank! Hope everyone had a Happy St. Patrick's Day! And if you need a little more green in your life, come by the Giant Ocean Tank at the Aquarium to visit Myrtle, our moray eels and the hundreds of other animals living on this Caribbean coral reef.